The Rainbow Unicorn Evolution — MAD STRATEGIES Inc.
Why are we so attracted to rainbow colours? What was once only something only geared toward children is now being seen across several industries. To say that rainbow colours have gone viral would be an understatement. From rainbow food to unicorn themed beauty trends, it's become a bit of an obsession. These days, rainbows can be found in more places than just your decked out birthday cake. Rainbow sushi, rainbow grilled cheese sandwiches and unicorn poop (cookies) are just a few of the new food trends. The beauty industry has also exploded with colour with the introduction of "holographic" lip gloss, eyeshadow, and a myriad of hair dye colours to achieve rainbow hair. So why is the rainbow trend spreading like a virus? In April of this year, Starbucks began selling “Unicorn Frappuccinos” and was only available from the 19th to the 23rd. Pictures of the whimsical drink were shared over 150 000 times on Instagram and Twitter was inundated with tweets about the Unicorn Frappuccino creating the buzz Starbucks was hoping for (regardless of how it tasted). Dizz’s Bagel & Deli in Montreal has also joined the rainbow evolution. 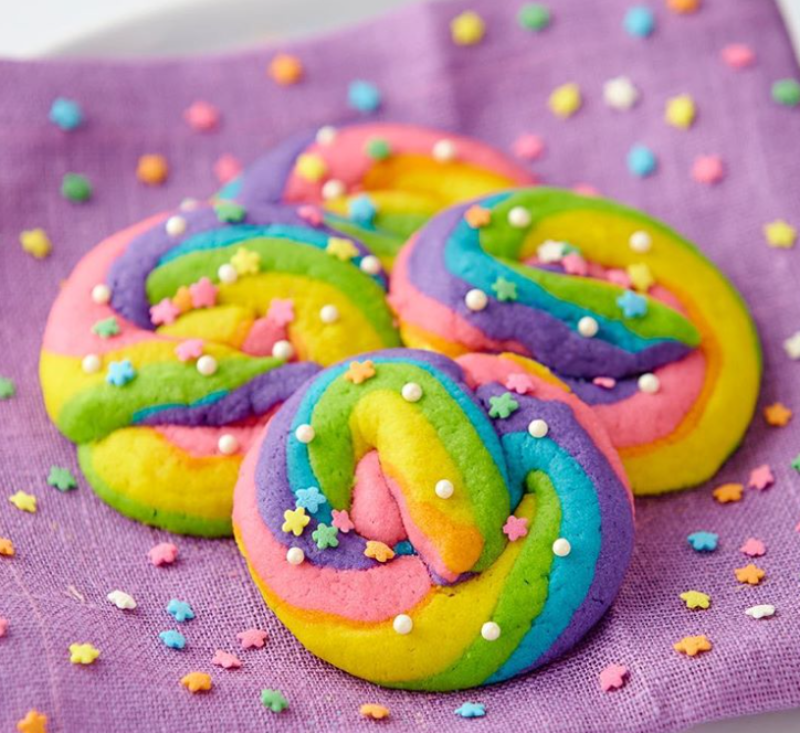 Along with other tasty bagels like chocolate & cheese bagels and apple cinnamon cheese sugar-coated bagels, you can find their latest creation, the rainbow bagel. Some would say that a rainbow bagel tastes better than its less colourful counterpart. Coloured foods can be entertaining to eat and fun to share on social media. When you stop and think about why people are attracted to rainbow colours, it becomes clear that the joy consumers get from the experience is what its all about. Whether we are talking about rainbow foods or rainbow hair, they are all selling the same thing: pure fun! Would your products benefit from a colour overhaul?